The closing gala for this year's New York Indian Film Festival (HuffPo), held in a banquet hall above NYU's Skirball Auditorium, was alive with artists, actors, filmmakers, and thinkers with work clearly committed to making the world better - and celebrating the illuminating power of film. I was fortunate to strike up a conversation with a young man I'd seen onstage earlier in the evening, bowing with the rest of the festival's filmmakers, now adroitly making his way through a roomful of conversations. of the influential indie music website Stereogum.com. Also filmmaker. Credit: Laura June Kirsch. "So, are you famous in some way that I should know?," I asked tongue-in-cheek. He gracefully demurred, though within moments we were locked in a conversation about his intriguing personal history -- as a musician, an International Law Journal editor, a corporate securities litigator, the executive editor of the influential indie music website Stereogum.com, an occasional television commentator, and not least, a Queens-born Indian-American. I was fascinated to learn how all these roles culminated in his moment here as a first-time filmmaker, having written, directed, produced, and appeared in the celebrated short film Dosa Hunt. I was taken back by the breadth of his background and how well he could articulate it. I was also impressed by his film's charming tagline: "The Greatest Hunt For South Indian Food In NYC Ever Committed To Film!" I promised to watch, but not before hearing more from its creator, Amrit Singh, himself. Film still from Amrit Singh's Dosa Hunt. Credit: dosahunt.com. That said, Amrit was firm that -- despite his film implicating so many profound notions of post-diaspora immigrant identity -- the result was a breezy, charming, and comedic 23 minutes, rooted in this cast's easy friendship, mutual respect, and artistic brotherhood. "I knew that our pursuit of this authentic food would naturally elicit conversations about culture, identity, and moms, like any good meal would." 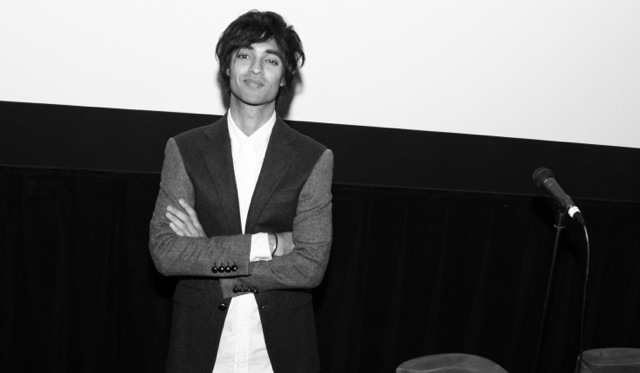 Amrit made a strong case for his film, like any good lawyer would. his film Dosa Hunt. Credit: Gunjesh / masalajunction.com. 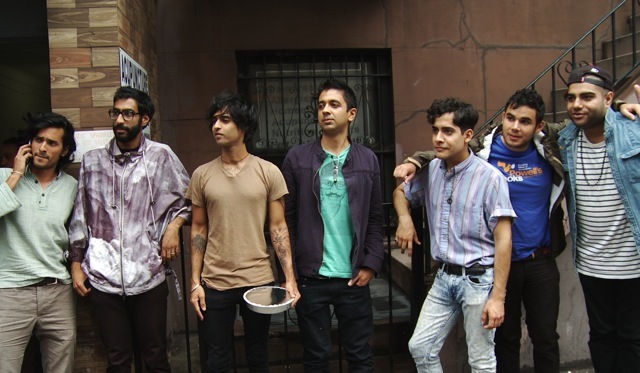 True to his word, Dosa Hunt is a delightful romp through the New York City of this multicultural group of illustrious independent musicians. They do find delicious dosa, but as in any great tale, the heart and the lessons are in the journey. Along the way, the cast enjoy conversations about their culture and their identities by way of debates over ingredients, discussions with mothers, arguments over cultural traditions and even Slumdog Millionaire. The group provides lots of laughs and thought-provoking banter, and the eclectic, world-class soundtrack is composed entirely by them, while dosa is served and consumed with glee. If this sounds like fun, that is because it is. It is also a very eye-opening experience, exposing the audience to an emerging culture built by artists eschewing traditional pressures to carve out their own paths. Another film still from Amrit Singh's Dosa Hunt. Credit: dosahunt.com. At the center of it all is Amrit Singh, whose presence ties the film together on camera, and whose direction has brought life and acclaim to the concept. Most of my role models in the arts looked nothing like me when I was growing up. And I've often thought about how different it must be for brown 15- year-olds now, to navigate a landscape of cultural and social expectations peppered with bona fide role models in the arts, like these guys, who graduated from Ivy League schools, took a chance in pursuing their creative passions, and are succeeding so visibly. It's a transitional moment in American's immigrant and art experience, and one that I felt strongly about documenting. 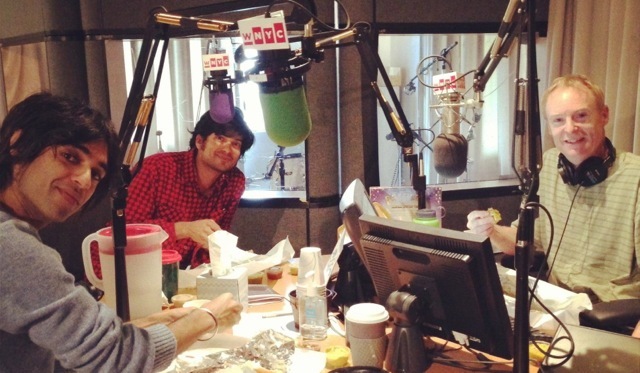 mouthful of dosa on NPR Soundcheck (WNYC Radio). Credit: dosahunt.com. As Amrit told me, the film focuses on the humble South Indian dish dosa, and is reverent to it in its myriad varieties, but the food itself is a device to explore something deeper. 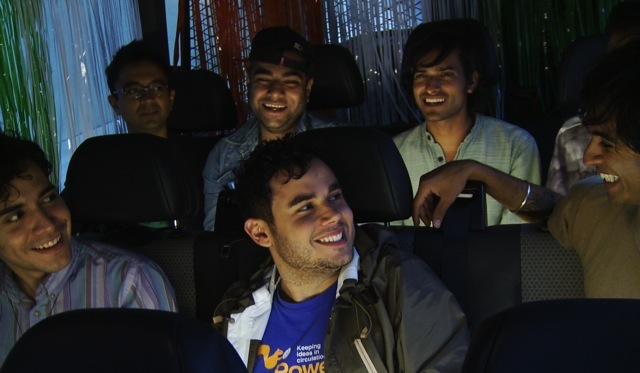 Particularly, it is a documentary about his cast, a group of high powered artists and friends that he says wouldn't have been possible even fifteen years ago: In addition to Singh himself, the film stars members of popular music groups like Vampire Weekend (who recently performed Saturday Night Live for their second time), the rappers Das Racist, the synth-pop artist Neon Indian, the world-music art-rockers Yeasayer, and the acclaimed jazz virtuoso Vijay Iyer. Honestly, names I was not overly familiar with. The film has enjoyed a tremendous critical response everywhere from New York Magazine (who called it "sharply funny") to Interview Magazine ("part No Reservations, part Big Brother, part something smarter") to The Times of India ("a short film about the Indian community's growth and search for cultural roots in the U.S.") -- and after hearing Amrit both on and off camera, it's clear that his gift for communicating, and his passion for elevated content, has been key to its success. 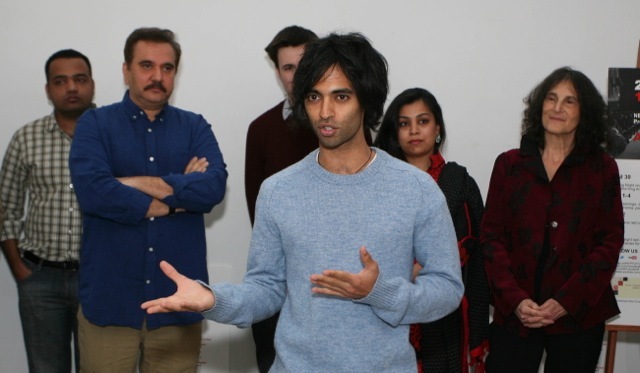 Amrit's ideas and ambitions for future projects, in light of his success connecting disparate cultures in his work to date, establish him is a youthful thought leader with a proven ability to represent and liaise with his new millennial generation. Dosa Hunt is a film you should see, and Amrit is a global citizen to watch. Filmmaker Amrit Singh, Esq. Emerges as Generational Voice. At the moment Dosa Hunt is making its way through the festival circuit -- having already screened to full houses in NYC, San Francisco, and Los Angeles -- with confirmed future screenings in New York City -- and Finland. Amrit plans to bring the film to London and, of course, India, before its eventual distribution on the Internet and television. You can learn more about Dosa Hunt and its future screenings at the film's official website (where you can join its mailing list), or you can follow the film on Twitter or Facebook for screening updates. 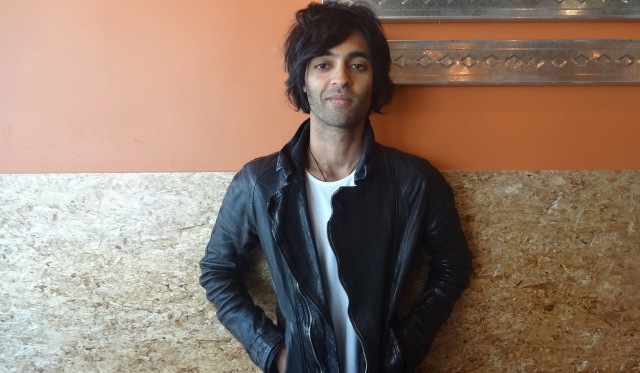 And you can keep up with Amrit himself on Twitter @amritsingh, or his personal website, or on Stereogum.com.